The last two days have been emotionally stressful for me, having finally come to a difficult decision to let go of some things. Last night I listened to Helen Jane Long, a pop pianist who plays simple yet elegant pieces I enter a Zen state within a short period of listening to her play but last night this was not to be. The stress made it difficult to find my Eudaimonic Self, even with the help of the music. I fell asleep disappointed. I woke up at 5:00 am rested but still disappointed. Something was cutting me off from getting to the place I rely on when first wakening. I laid in bed listening to a variety of music until 6:15 am when I decided this might be the time to go on my first nighttime ride. It soon would be dawn but there was enough darkness left to get a taste of riding in the night. With my pre-ride ritual done, including attaching an LED light strip to the back of my helmet, I was out the garage in 20 minutes. I played the same piano music I listened to the night before, what might otherwise seem like an odd choice for a motorcycle ride but it might just fit this time. Without the sun to warm the air, the wind blowing over me was chilly. 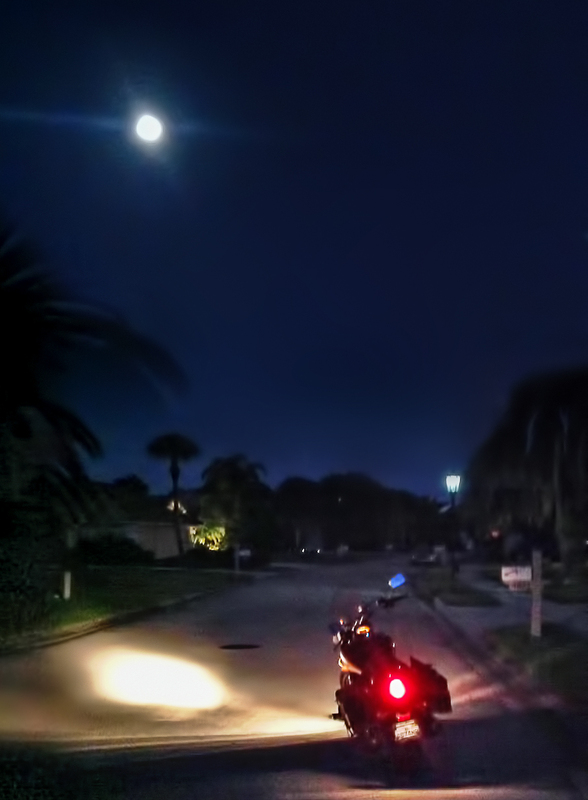 The street rolled by me bathed in the glow of my headlight and I began to understand the appeal of predawn riding. I With a full moon hanging in a clear sky, I flashed on Ansel Adam’s famous photograph Moonrise Over Hernandez taken on November 1st, 1941 in New Mexico. I stopped to take a snapshot with my iPad: Moonrise Over Vulcan. (click on image to see larger version). I approached the main gate and it did not open. I suspected it was not turned on because of the early hour. If in a car I would have had no choice but to turn around and go to the gate across the complex. But I’m not in a car. I rode up on the sidewalk and cut across to the other side. I got back to the street and into the now predawn light. The stillness fit the piano music playing in my helmet. Who would have thought such quiet music could work on a motorcycle? The ride to the coffee shop was pleasant and when I arrived there are several people in their own morning ritual. I placed my order of a mocha and blueberry scone, sat down and pulled out my iPad to connect to the coffee shop WiFi. All this technology has done so much for us. When I decide to listen to music on the ride, I did not have it stored on my iPad. But with the touch of a single button I downloaded it as I prepared my for ride: four CDs worth of music downloaded in five minutes. A touch of a few buttons and my iPad synced with my helmet speakers. I also needed safety lights for the ride; I had a LED strip ready to attach to the helmet. All these technological devices took seconds to use, making things possible that would have seemed like the world of The Jetsons twenty years ago. Imagine that even ten years ago. I also had been researching tire pressure and finished that while sipping my coffee, followed by a visit to Amazon to order a tire pressure gauge to be delivered to my doorstep. Think what getting all these things done would have taken in 1983? Thirty years later it was done in a few minutes. Earlier I had thought how the simplicity and elegance of Apple’s new iOS 7 interface underscored we have arrived at a fully computerized world. We now accept icons need be nothing more than flat squares or even dots of simplicity and elegance. The physical age is receding behind us but we are the beneficiaries of so much. We have hardware and software designers to thank for all this, who have created a system of devices and global communication services that is impressive. Is anything the computer age can’t do for us? Next to the table where I am sitting is an elderly man who I’ve seen from time to time at the coffee shop. I had no idea who he was but his look was familiar to me. He stared into his coffee cup, motionless, he was slightly overweight, his clothes disheveled and slightly stained. His appearance was familiar to me as it would be to many mental health workers: a psychiatric patient without much help. Of course, I have no idea if this was true but there is a distinct look to such patients that mental health case managers come to know well, patients in the system who get just enough care to get by and whom you could easily find in a coffee shop at 7:00 am sitting alone staring into their coffee cup. There I sat with technological devices thinking there was nothing the computer age can’t improve on, and there was this man who reminded me of something very different. I wanted to engage him but it wasn’t my place to disturb him uninvited. When I looked up I saw him look at me and my mocha, muffin, iPad and blinking helmet on the table. He smiled. I smiled back. Nothing is said even though I hoped he would start a conversation. But he never did. A few moments later I glanced back to find him once again staring into his coffee cup. I left him in the peace he came to have. For all the wonders of technology we still struggle with how to best help those most in need in our society, the people with severe psychiatric problems or even the more common issues of moderate depression and anxiety. Without going down this road at the moment, suffice it to say that for all the new psychiatric medications and psychotherapies of the past twenty-five years, there is still no “dot” you can just tap to “quit” these problems. Such issues are far more complex than an elegant interface and clever programming can solve. Something else is needed here, something a dear friend of mine understands well. My friend once worked as a social work case manager at a facility where she would have seen patients who looked similar to the man sitting at the table. If this man had been in such a place and was fortunate enough to have her as a case manager, he would have received some of the best care available. She was a gifted case manager who knew how to make almost anyone feel heard and genuinely cared for. We have turned caring for each other into a “profession”, something that has been much written about in the sociology literature. For my friend, however, it has been much more than “professional care.” While never unprofessional in her work, her personality shined through as one of most caring ones you could meet. I’ve often thought if everyone had to work as a social worker for a couple years with clients like my friend worked with and if those experiences were given the time to wash over and inhabit your soul, much would change for us as individuals and a society. People could still go on to design incredible interfaces like the iOS 7 and all the hardware and communication networks to support them, and that is exactly what many of them should do. But those social work experiences would make sure something else would come along for the ride, something we need to make sure comes for the ride. Few situations can show us so much of what that is in such a small amount of time as being a social worker in a clinic or facility. Few experiences can show us what my friend has in abundance but is not programmable. I finished my coffee and muffin and got back to my motorcycle for the ride home. By now the sun had risen but the air was still cool. I start the music again With the sun still low on the horizon, the shadows were stretched out and leaning in the same direction, as if you were looking in the doorways of a world hiding under every object. I noticed that Helen Jane Long’s piano playing finally took me to the place I could not get to last night. I was back where I wanted to be. I pulled up to the gate and this time it was working. It struck me that a gate I could not cross just an hour earlier could now be crossed with ease.